A developer whose hallmark is technical wizardry, Yu Suzuki’s AM2 were responsible for eye-popping innovation throughout the 80s and 90s with arcade titles such as Space Harrier, OutRun and Virtua Fighter. Open-world RPG Shenmue would become his Symphony No. 8, his Sagrada Familia, as wild ambition and development costs swelled beyond sales that were realistically possible on SEGA’s under-performing Dreamcast. Leon, Darren Forman, James and special guest Dan Clark of The AI Bots podcast are your Yokosuka tour guides. Great podcast. Replaying shenmue 2 in anticipation for the next. I especially enjoyed this one as i adore the Shenmue series. Thanks for being so gentle during your revisit to episode one, sensibly comparing it to games of the time rather than those on more recent gen hardware. Back in the day, after hours watching the Coy Carp and admiring the water feature in the Hazuki residence garden, I finally finished Shenmue 1. However, I stopped short of completing Shenmue 2, anticipating Microsoft’s “I Love Bees” campaign to be a Shenmue 3 announcement. As we all know, that never came to be. Neither was “I Love Bees” the much mooted Microsoft-Nintendo merger/buy-out. Anyway, thanks for memories (sounds like a good name for a song), and thanks also for giving me a reason to pick up and play Shenmue 2 again. 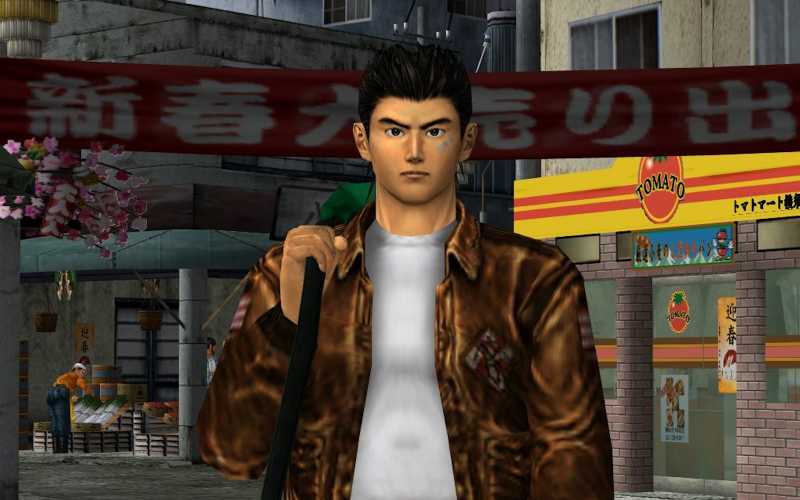 Can’t wait to latch onto an unsuspecting NPC, using the left trigger button, and go for an uncontrolled meander around the steaming treats, sorry….teeming streets of Shenmue 2. Thanks for the amazing show! As a Shenmue fan it helped me see alot of the flaws this game has, but also why I still love this weird title. I don’t think we’ll ever see Shenmue 3, and if we did… it wouldn’t be the same after all this time past. I’m pleased to hear that Shenmue fans didn’t think I was too harsh on the game! We’re not about laying into sacred cows on C&R but we are honest about our experiences and my experience, playing Shenmue in 2012, is that it hasn’t aged particularly gracefully. That said, as I make pains to stress in the podcast, there is much to admire in the game nonetheless. Hi. I personally love the shenmue games and completed shenmue for the 4th time just a couple of hrs ago. Im planning on completing the 2nd in the next week, but please can somebody make the final one as I really would like to know the ending. Some of your complaints seem a bit silly if I’m honest. The complaints about the voice acting being bad and that you had heard better at that time in particular stood out as odd. Few games had any voice acting back then really and if they did, they weren’t particularly good either. The story started very basic and cliché, but as the game went on it turned the formula around into something different and stood out amongst the few games at the time that even spent five minutes on the narration and characters. The only games that would probably ahead of it in that field were most likely adventure games, and even most of them at the time went for the cartoon humour. I’m honestly jealous of the many, many Shenmue lovers out there, and I’m feeling super happy for them this morning after last night’s amazing announcement – and the brilliant response to the Sony-backed Shenmue III Kickstarter. I played the game at the time of its release and I was struck even then by the sub-standard voice work and scripting. Many reviews at the time commented on it too, but certainly it was easier to give those elements a pass in 2000 than it is today, even though there had already been many games which I felt had succeeded far better in that regard. When we review games on Cane and Rinse we report our own experience however, and when it came down to it my overall immersion and enjoyment suffered due to the clunking voice performances, and as such I had to express that.